The Warriors last lost on April 10, when the desperate Utah Jazz beat Golden State by six points in the final week of the NBA regular season. Since then, they have swept their way through three consecutive series, only ever running into occasional trouble and spending most of their time protecting huge leads. Their margins of victory have been imposing, as they beat the Blazers, Jazz, and Spurs by 18, 14.5, and 16 points per game respectively. The Warriors have lost one game in the last 73 days. Simply put, this has been one of the most dominant playoff runs in decades, made less notable by the Cavs’ near-equal detonation of the Eastern Conference. Tonight, the Spurs played yet another game without Kawhi Leonard and suffered through yet another loss. Game 4 never got too out of hand, and San Antonio managed to push their way back into it at times, but Golden State’s firepower is simply too much to overcome, and even without Klay Thompson and their starting center, it never felt like the Spurs even had a chance tonight. When they’d mount the odd run and cut the lead to single digits, inevitably Kevin Durant or Steph Curry would wake up, hit a shot or three, swell the lead back to 20, and chill for a bit. Durant went for 29 points on just 13 shots, hitting every mid-range he took. Steph Curry had 36 and he was incisive off the pick-and-roll tonight, clearly unintimidated by anyone the Spurs could throw on him. With Leonard, the Spurs got Golden State off their rhythm and found a way to press their advantages. Without him, they were hopeless. Unless the Celtics pull off a miracle, Golden State will now lie in wait for the Cavs for the third summer running. Cleveland has also dispatched opponents with ease and they won their first 10 games of the postseason before losing to the Celtics on an Avery Bradley game-winner. While both runs have been as impressive on paper, Golden State is playing at a higher level than the Cavs. Curry and Durant have figured out how to play together and Draymond Green is also on a roll. His defensive instincts have never looked sharper and he makes at least three plays per game that it seems no other defender could, like tonight when he watched two of his teammates get beat out of a pick-and-roll, saw where Manu Ginobili’s pass was headed and stepped over to snag it away, saving a dunk. When Klay Thompson finds his shot again, the Warriors will look even better. The additions of David West and JaVale McGee give them a new dimension that they lacked last year after Andrew Bogut got hurt, and while LeBron James remains the best player on the planet, the Warriors have improved after last year’s humiliation while the Cavs have slipped a little bit. They have no interior bite apart from Tristan Thompson’s offensive rebounding and their bench is full of old guys. It didn’t matter last year when LeBron hulked out and dragged his team back into the series, and if he reaches that level again, all bets are off. He’s beaten Durant in the Finals before, albeit with a much better team around him. LeBron can’t really be contained, but now that Durant has joined up with an already historic Warriors offense, it’s hard to see the Cavaliers significantly slowing Golden State down on that end. 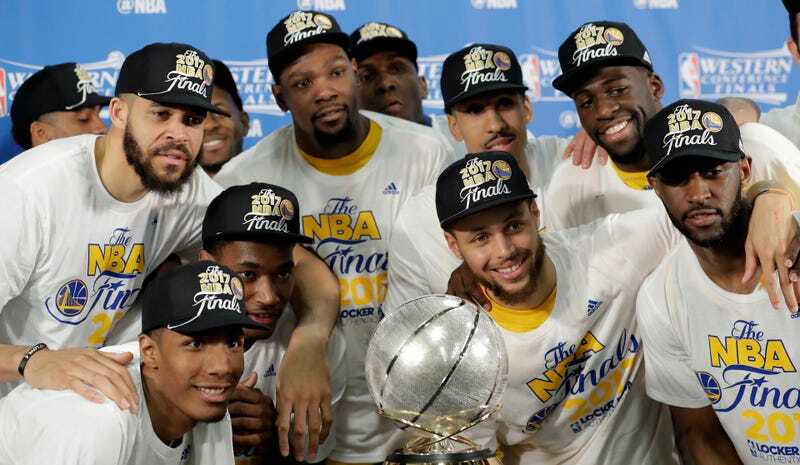 They may have the series’ trump card, but Golden State is playing as well as they have all year and it will take more to stop them this year. Steph Curry Calls Out Dewayne Dedmon For "Dirty Play"